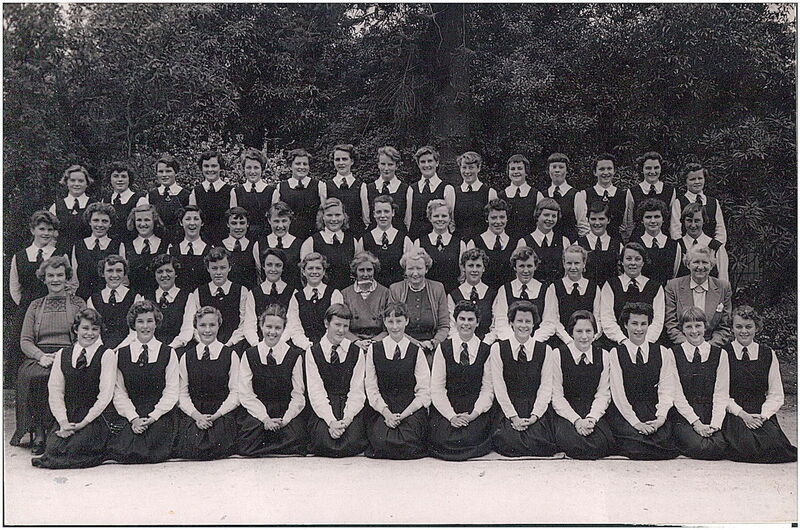 Class Photos 1955 - Brighton technical school, Victoria, Australia. Dawn Martin, Marg. Westerman, Verity Neville, Jocelyn Birch, Judith Luxmore, Judith Barwick, Bev Yates, Helen Lunn, Judith Power, Kay Thomas, Annette Cleal, Janice Benson, Joan Anderson, Bev Wilde, Dorothy Sheppard. Marg Beddone, Pam Anderson, Janice Roberts, Pam Stevenson, Diane Barton, Gwen Sampson, Helga Weid, Gillian Skyes, Val McDonald, Alison Jewell, Val West, Bev Kinghorne, Jo Daws, Sandra LePlastrier. Miss Keane, Jocelyn Griffith, Bev Paydon, Eliz. Birch, Pauline Brand, Pam Hall, Miss Benton, Miss Carroll, Kay Hindson, Nola Smith, Margaret Dexter, Pam Hughes, Miss Jageurs. Margaret Newton, Carolyn Strahan, Pam Sonnberger, Elaine Brown, Judith Lunn, Lea Cook, Rita Glass, Bev Cook, Elizabeth Mason, Val Evans, Jo Hayes, Kay Little.